Observation - White lichen - UK and Ireland. Description: White, crustose lichen with a black prothallus. Black,lecanorine apothecia. Found on sandstone gravestones. 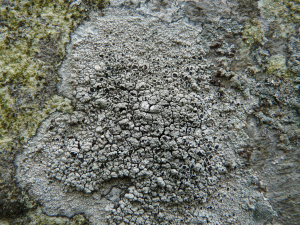 White, crustose lichen with a black prothallus. Black,lecanorine apothecia. Found on sandstone gravestones.